Beautiful Jenny kindly wrote down one of Tim Selby‘s finest food creations and sent it to me on my birthday (a marvellous & unique gift). It is a surprisingly delicious concoction, which we have eaten regularly since March. I wanted to share this recipe far and wide with friends and family, so Tim’s crazy kitchen antics can live on for years to come – enjoy! Slice up the halloumi into thick pieces and fry in a teeny bit of oil until it starts to go golden. Add in the (chopped) chili, garlic and (sliced) red peppers. Slice up your mangoes into juicy chunks and let it all sizzle away in the pan. Once it has begun to juice up a bit, squeeze in some lime. Roughly chop loads of coriander and stir into the pan until it is wilted down into the curry. Tim’s Tip; Be slap dash and don’t wash up after! 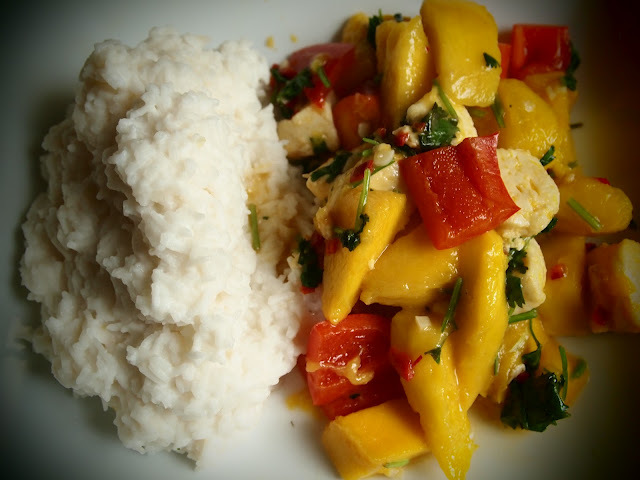 Gallery | This entry was posted in Recipes / Food and tagged Chili, Coriander, Curry, Food, Halloumi, Mango, Recipe, Selby's Halloumi & Mango Delight, Tim Barraud, Tim Selby, Tim Selby Barraud, Vegetarian, Veggie. Bookmark the permalink. Have Truffle Hunter tell me on Thursday night what the Halloumi is! Would love to try this recipe! Halloumi is a type of cheese, it will stay together when cooked, it’s good for curries and kebabs. I hope you give it a go and I will be posting something sweet for you to cook soon!